Obtaining a vanity toll free number is a smart move for your business and paves the way for many more opportunities. The ease of remembering a vanity number offers a business the chance to expand its branding and advertising efforts using only a highly versatile phone number. It’s like adding just one extra level of cushioning to a facet you already need and use. A vanity number can be extremely beneficial in advertising campaigns that utilize visual media such as commercials, flyers, and billboards. When companies use their vanity numbers in advertising and marketing campaigns, they have the ability to increase response rates and lead generation is known to increase substantially. If you decide that you are going to market your company using visual advertising on billboards and magazines, this study found that there was an 84% improvement in consumer recall rates when a vanity number was featured at the forefront. Displaying a toll free number on a billboard is a smart move for businesses because there is an immediate spike in calls because of how simple they are to remember for customers. Unforgettable vanity 800 numbers and easy to remember toll free numbers are also perfect for boosting your company’s bottom line because your customers know exactly why they’re calling 1-800-PLUMBER. Also, at that desperate moment, they need a plumber, 1-800-PLUMBER is impossible to forget. A vanity number asserts your company as the industry leader, offering customers the invaluable benefit of instant recall. Not only are vanity 800 numbers unforgettable to your customers, they provide results. If you have a vanity 800 number, it is important that you showcase it widely. In addition, 800 numbers are toll free and the customer knows that when they call a toll free number it will be completely free for them, which encourages them to place more calls. Many attorneys use 1-800 numbers in their billboards to attract clients to their practice. Advertising with a toll free number on a billboard can be beneficial for many companies, not just attorneys. Displaying your toll free number prominently on a billboard in front of the right location and the right audience can bring in many new clients. Billboards on popular local highways that thousands of people commute through each day is the ideal location for your billboard campaign. Contacting an advertising agency to create the best message for your brand is the next step after you have found your perfect billboard location. Make sure that your slogan is catchy, easy to read, and includes your company’s toll free number prominently. Once you have your perfect billboard displayed prominently in front of your target audience you can sit back and wait for the calls to start rolling in, as your marketing team tracks the new generation of income. The price of a billboard varies from city to city. In rural areas, it can be as low as $250 compared to as much as $14,000 in New York City. A sizable amount of your business’ budget should be allocated for advertising needs, and a billboard is an affordable way to reach a broader audience. The use of a prominent 800 number will increase the response rate. Of course, it is quite hard to monitor billboard conversions. It is possible that a million people will see your billboard, but if you are an attorney and someone remembers your number from the ad and they do not have a legal situation that needs to be handled at the present time, they may call you months later. To make certain that you can accurately calculate your ROI from billboard conversions there are certain steps that you can take. For instance, if the toll free number displayed on your billboard is only being advertised from the billboard, then you can peruse your phone records to monitor the increase in call rates since the time the billboard went up. The next step is to ask every single caller how they heard about your firm. All businesses should ask this question at some point in a conversation with a customer as it is an easy way to track your current marketing strategies. If all of your calls are coming from your billboard advertisements and you receive zero phone calls from the people you targeted with door hangers, you can easily cut that marketing effort from your budget. 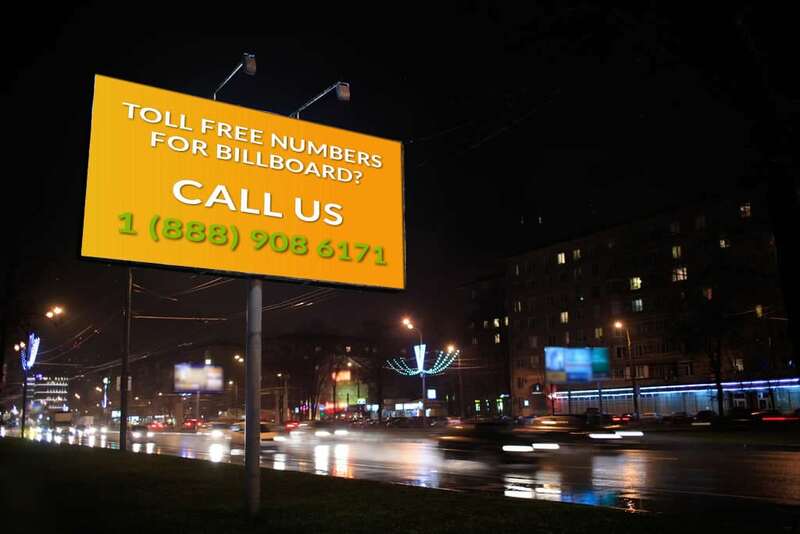 Advertising with toll free numbers on billboards is a powerful marketing tool that will yield amazing, and often proven results. Multiple studies have confirmed that companies who utilize their toll free number in media displays for advertising see high increases in response rate. If you already have a toll free number, a billboard campaign is a great next step towards growing your business.